Catholic Action president, Thomas McKenna, was granted the following interview with Cardinal Raymond Burke to further explain the intentions of the four cardinals and the published documents entitled “Seeking Clarity: A Plea to Untie the Knots in Amoris Laetitia." The full text is provided at the end of the interview. Catholic Action: Your Eminence, thank you for taking the time to have this interview with us about what you have published today. The substance of the documents which you and the other Cardinals have made public is called “Dubia.” Can you please explain what Dubia means and what the presentation of Dubia involves? 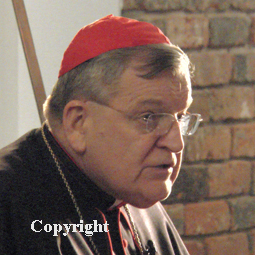 Cardinal Burke:It is my pleasure to discuss these important matters with you. The title of the document is, “Seeking Clarity: A Plea to Untie the Knots in ‘Amoris Laetitia’.” It has been co-authored by four cardinals: Walter Cardinal Brandmüller, Carlo Cardinal Caffarra, Joachim Cardinal Meisner, and myself. My fellow cardinals and I are publicizing a plea that we have made to the Holy Father, Pope Francis, regarding his recent Apostolic Exhortation, Amoris Laetitia. Portions of the document contain ambiguities and statements that are like knots that cannot be easily untied and are causing great confusion. Sharing the Pope’s devotion to Our Lady, Untier of Knots, we are asking him to clarify these ambiguous statements and, with the help of God, to untie some of the knotty statements of the document for the good of souls. Dubia is the plural form of the Latin word, dubium which means a question or a doubt. When, in the Church, an important question or doubt arises about the faith itself or its practice, it is customary for Bishops or priests or the faithful themselves to articulate formally the question or doubt and to present it to the Roman Pontiff and his office which is competent to deal with it. The formulation of an individual question or doubt is called simply a dubium. If more than one question or doubt is articulated, they are called dubia. The Post-synodal Apostolic Exhortation Amoris Laetitia has raised a number of questions and doubts in the minds of Bishops, priests and the faithful, many of which have already been presented to the Holy Father and discussed publicly. In the present case, four Cardinals have presented formally to the Holy Father five fundamental questions or doubts regarding faith and morals based on the reading of Amoris Laetitiae. CA: Many people in the Church right now are discussing what is designated as “pastoral.” Can you tell us a little about the document you have published today, and how that relates to being pastoral? Truth spoken with charity is clear and pastoral. It is never helpful pastorally to leave important matters, in the present case matters touching upon the salvation of souls, in doubt or in confusion. We four Cardinals, as Bishops who are committed to the pastoral care of the universal Church and as Cardinals who have the particular responsibility of assisting the Holy Father in the teaching of the faith and in the fostering of its practice in the universal Church, have judged it our responsibility to make public these questions for the sake of the good of souls. CA: This co-authored document is actually a number of documents, as the headings indicate. Would you mind explaining why there are different parts, and what they mean? The core of what we are publishing today is a letter which we four Cardinals initially sent to Pope Francis, along with the dubia – that is, along with a series of formal and serious questions – about Amoris Laetitia. The process of submitting formal questions is a venerable and well-established practice in the Church. When the question concerns a grave matter that affects many of the faithful, the Church responds to these questions with a “yes” or “no”, sometimes with explanation. We also sent a copy of the letter and dubia to Cardinal Gerhard Ludwig Müller, the head of the Congregation for the Doctrine of the Faith which has the particular competence regarding such questions. In order to provide the background for the letter and our questions about Amoris Laetitia, we are also publishing a brief forewordand an explanatory note, which explain the context of the letter and the dubia or questions along with a commentary on each of the questions themselves. CA: So you are saying that you are publishing a letter that you sent to the Pope privately. This is extraordinary. Isn’t this action objectionable from a Christian point of view? Our Lord said in the Gospel of Matthew (18:15) that if we have a problem with a brother, we are supposed to talk with him privately, one-on-one, not publicly. In the same portion of Sacred Scripture to which you refer, Our Lord also said that, after addressing a difficulty to a brother, individually and together with others, without it being resolved, then, for the good of the Church the matter is to be presented to the whole Church. This is precisely what we are doing. There have been many other statements of concern regarding Amoris Laetitia, all of which have not received an official response from the Pope or his representatives. Therefore, in order to look for clarity on these matters, three other Cardinals and I used the formality of presenting fundamental questions directly to the Holy Father and to the Prefect of the Congregation of the Doctrine of the Faith. No response has been given to these questions either. Therefore, in making public our questions or dubia, we are being faithful to Christ’s mandate to first talk with a person privately, then in a small group, and finally, taking the matter to the Church as a whole. CA: As you say, Amoris Laetitia has been the subject of much discussion, and even criticism. For example, you have famously stated that you believe it is not a Magisterial document. Could you explain how your current questions to the Holy Father relate to these other analyses of the Apostolic Exhortation? To understand the present publication, we need to consider what has led up to it. Just after his election, in his first Sunday Angelus message, Pope Francis praised Cardinal Walter Kasper’s understanding of mercy, which is a fundamental theme in Amoris Laetitia. Only a few months later, the Vatican announced an Extraordinary Synod about Marriage and Family for October 2014. In preparation for the Synod, I, along with four other Cardinals, an Archbishop, and three theologians, published a book, Remaining in the Truth of Christ. As a member of the Synod, I noted that the mid-term report lacked a solid foundation in Sacred Scripture and the Tradition of the Church. Later, I agreed with other Cardinals that there was manipulation in the running of the Synod itself, and in the writing of the final report of the Synod. Prior to the 2015 Synod, to which I was not invited, eleven Cardinals contributed to a book about marriage and the family. Although I did not contribute to this book, I read it with great interest. Also prior to the 2015 Ordinary Synod on the Family, over 790,000 Catholics signed a “Filial Appeal” to Pope Francis about the future of the family, asking him to say “a clarifying word” to dissipate the “widespread confusion” about Church teaching. Along with other Cardinals, I was a signatory. During the 2015 session of the Synod, thirteen Cardinal-participants signed a letter to the Pope indicating their concern about the manipulation of the process of the Synod. In April 2016, Pope Francis published Amoris Laetitia as the fruit of the 2014 and 2015 sessions of the Synod of Bishops. In the summer of 2016, forty-five academics, including some prelates, wrote to the Holy Father and to the College of Cardinals, asking the Pope to repudiate a list of erroneous propositions that can be drawn from portions of Amoris Laetitia. This received no public response. On 29 August, 2016, I joined many bishops, priests, and lay faithful in signing a Declaration of Fidelity to the Church’s Teaching on Marriage and to Her Uninterrupted Discipline. This also has received no public response. My position is that Amoris Laetitia is not Magisterial because it contains serious ambiguities that confuse people and can lead them into error and grave sin. A document with these defects cannot be part of the Church’s perennial teaching. Because that is the case, the Church needs absolute clarity regarding what Pope Francis is teaching and encouraging. CA: Some Catholics may be concerned that your current publication is an act of disloyalty. I, together with the other three Cardinals, are striving to be loyal to the Holy Father by being loyal to Christ above all. By making public our plea for clarity of doctrine and pastoral practice, we are hoping to make this a discussion for all Catholics, especially our fellow bishops. Every baptized person should be concerned about doctrine and moral practices regarding the Holy Eucharist and Holy Matrimony, and about how we are to identify good and evil actions. These matters affect all of us. Rather than being a matter of disloyalty to the Pope, our action is deeply loyal to everything that the Pope represents and is obliged to defend in his official capacity. Pope Francis has called for candid speech in the Church a number of times, and has asked members of the hierarchy for openness and accountability. We are being candid, with the fullest respect for the office of the Holy Father, and exercising, according to the light of our consciences, the openness and accountability which the Church has the right to expect of us. This is my duty as a Cardinal of the Catholic Church. I was not created a Cardinal in order to receive an honorary position. Rather, Pope Benedict XVI made me a Cardinal to assist him and his successors in governing the Church and teaching the Faith. All Cardinals have the duty of working closely with the Pope for the good of souls, and this is precisely what I am doing by raising questions of grave importance regarding faith and morals. I would not be fulfilling my duty as a cardinal, and therefore as counselor to the Pope, if I remained silent on an issue of such serious matter. CA: If I may, I would like to continue this line of thought. It is unclear how your publication is being docile to the Pope’s desire for greater pastoral sensitivity and creativeness in the Church. Hasn’t the Pope indicated his position in a letter to the Argentine Bishops? Other Cardinals have said that the proper way to read Amoris Laetitia is that it allows divorced-and-remarried couples to receive communion in certain circumstances. In that light, one could argue that your document is creating more confusion. First, a point of clarification. The issue is not about divorced and remarried couples receiving Holy Communion. It is about sexually active but not validly married couples receiving Holy Communion. When a couple obtains a civil divorce and a canonical declaration that they were never validly married, then they are free to marry in the Church and receive Holy Communion, when they are properly disposed to receive. The Kasper proposal is to allow a person to receive Holy Communion when he or she has validly pronounced marriage vows but is no longer living with his or her spouse and now lives with another person with whom he or she is sexually active. In reality, this proposal opens the door for anyone committing any sin to receive Holy Communion without repenting of the sin. I would also like to point out that only the first of our questions to the Holy Father focuses on Holy Matrimony and the Holy Eucharist. Questions two, three, and four are about fundamental issues regarding the moral life: whether intrinsically evil acts exist, whether a person who habitually commits grave evil is in a state of “grave sin”, and whether a grave sin can ever become a good choice because of circumstances or intentions. It is true that the Holy Father wrote a letter to the Argentinian Bishops, and that some Cardinals have proposed the interpretations of Amoris Laetitia that you have mentioned. However, the Holy Father himself has not clarified some of the “knotty” issues. It would contradict the Faith if any Catholic, including the Pope, said that a person can receive Holy Communion without repenting of grave sin, or that living in a marital way with someone who is not his or her spouse is not a state of grave sin, or that there is no such thing as an act that is always and everywhere evil and can send a person to perdition. Thus, I join my brother Cardinals in making a plea for an unmistakable clarification from Pope Francis himself. His voice, the voice of the Successor of Saint Peter, can dispel any questions about the issue. The sending of the letter to His Holiness Pope Francis by four cardinals has its origin in a deep pastoral concern. We have noted a grave disorientation and great confusion of many faithful regarding extremely important matters for the life of the Church. We have noted that even within the episcopal college there are contrasting interpretations of Chapter 8 of "Amoris Laetitia". We hope that no one will choose to interpret the matter according to a “progressive/conservative" paradigm. That would be completely off the mark. We are deeply concerned about the true good of souls, the supreme law of the Church, and not about promoting any form of politics in the Church. We hope that no one will judge us, unjustly, as adversaries of the Holy Father and people devoid of mercy. What we have done and are doing has its origin in the deep collegial affection that unites us to the Pope, and from an impassioned concern for the good of the faithful. Following the publication of your Apostolic Exhortation "Amoris Laetitia", theologians and scholars have proposed interpretations that are not only divergent, but also conflicting, above all in regard to Chapter VIII. Moreover, the media have emphasized this dispute, thereby provoking uncertainty, confusion, and disorientation among many of the faithful. Now, compelled in conscience by our pastoral responsibility and desiring to implement ever more that synodality to which Your Holiness urges us, we, with profound respect, we permit ourselves to ask you, Holy Father, as Supreme Teacher of the Faith, called by the Risen One to confirm his brothers in the faith, to resolve the uncertainties and bring clarity, benevolently giving a response to the "Dubia" that we attach to the present letter. "Dubia" (from the Latin: “doubts”) are formal questions brought before the Pope and to the Congregation for the Doctrine of the Faith asking for clarifications on particular issues concerning doctrine or practice. Upon the publication of the post-synodal Apostolic Exhortation "Amoris Laetitia" on love in the family, a debate has arisen particularly around its eighth chapter. Here specifically paragraphs 300-305 have been the object of divergent interpretations. For many - bishops, priests, faithful - these paragraphs allude to or even explicitly teach a change in the discipline of the Church with respect to the divorced who are living in a new union, while others, admitting the lack of clarity or even the ambiguity of the passages in question, nonetheless argue that these same pages can be read in continuity with the previous magisterium and do not contain a modification in the Church’s practice and teaching. Motivated by a pastoral concern for the faithful, four cardinals have sent a letter to the Holy Father under the form of "Dubia", hoping to receive clarity, given that doubt and uncertainty are always highly detrimental to pastoral care. The fact that interpreters come to different conclusions is also due to divergent ways of understanding the Christian moral life. In this sense, what is at stake in "Amoris Laetitia" is not only the question of whether or not the divorced who have entered into a new union can - under certain circumstances - be readmitted to the sacraments. Thus, while the first question of the "Dubia" concerns a practical question regarding the divorced and civilly remarried, the other four questions touch on fundamental issues of the Christian life. It is asked whether, following the affirmations of "Amoris Laetitia" (nn. 300-305), it has now become possible to grant absolution in the sacrament of penance and thus to admit to Holy Communion a person who, while bound by a valid marital bond, lives together with a different person "more uxorio" (in a marital way) without fulfilling the conditions provided for by "Familiaris Consortio" n. 84 and subsequently reaffirmed by "Reconciliatio et Paenitentia" n. 34 and "Sacramentum Caritatis" n. 29. Can the expression “in certain cases” found in note 351 (n. 305) of the exhortation "Amoris Laetitia" be applied to divorced persons who are in a new union and who continue to live "more uxorio"? Question 1 makes particular reference to "Amoris Laetitia" n. 305 and to footnote 351. While note 351 specifically speaks of the sacraments of penance and communion, it does not mention the divorced and civilly remarried in this context, nor does the main text. - They avoid giving scandal (that is, they avoid giving the appearance of sin so as to avoid the danger of leading others into sin). The conditions mentioned by "Familiaris Consortio" n. 84 and by the subsequent documents recalled will immediately appear reasonable once we remember that the marital union is not just based on mutual affection and that sexual acts are not just one activity among others that couples engage in. Sexual relations are for marital love. They are something so important, so good and so precious, that they require a particular context, the context of marital love. Hence, not only the divorced living in a new union need to abstain, but also everyone who is not married. For the Church, the sixth commandment “Do not commit adultery” has always covered any exercise of human sexuality that is not marital, i.e., any kind of sexual acts other than those engaged in with one’s rightful spouse. - A divorce does not dissolve the marriage bond, and the partners to the new union are not married. However, people who are not married can under certain circumstances legitimately engage in acts of sexual intimacy. - A divorce dissolves the marriage bond. People who are not married cannot legitimately engage in sexual acts. The divorced and remarried are legitimate spouses and their sexual acts are lawful marital acts. A divorce does not dissolve the marriage bond, and the partners to the new union are not married. People who are not married cannot legitimately engage in sexual acts, so that the divorced and civilly remarried live in a situation of habitual, public, objective and grave sin. However, admitting persons to the Eucharist does not mean for the Church to approve their public state of life; the faithful can approach the Eucharistic table even with consciousness of grave sin, and receiving absolution in the sacrament of penance does not always require the purpose of amending one’s life. The sacraments, therefore, are detached from life: Christian rites and worship are in a completely different sphere than the Christian moral life. After the publication of the Post-synodal Exhortation "Amoris Laetitia" (cf. n. 304), does one still need to regard as valid the teaching of St. John Paul II’s Encyclical "Veritatis Splendor" n. 79, based on Sacred Scripture and on the Tradition of the Church, on the existence of absolute moral norms that prohibit intrinsically evil acts and that are binding without exceptions? According to "Veritatis Splendor", with intrinsically evil acts no discernment of circumstances or intentions is necessary. Uniting oneself to a woman who is married to another is and remains an act of adultery that as such is never to be done, even if by doing so an agent could possibly extract precious secrets from a villain’s wife so as to save the kingdom (what sounds like an example from a James Bond movie has already been contemplated by St. Thomas Aquinas, "De Malo", q. 15, a. 1). John Paul II argues that the intention (say, “saving the kingdom”) does not change the species of the act (here: “committing adultery”), and that it is enough to know the species of the act (“adultery”) to know that one must not do it. After "Amoris Laetitia" (n. 301) is it still possible to affirm that a person who habitually lives in contradiction to a commandment of God’s law, as for instance the one that prohibits adultery (cf. Mt 19:3-9), finds him or herself in an objective situation of grave habitual sin (cf. Pontifical Council for Legislative Texts, Declaration, June 24, 2000)? Along the same lines, in his encyclical "Ecclesia de Eucharistia", n. 37, Saint John Paul II recalls that “the judgment of one’s state of grace obviously belongs only to the person involved, since it is a question of examining one’s conscience.” Hence, the distinction referred to by "Amoris Laetitia" between the subjective situation of mortal sin and the objective situation of grave sin is indeed well established in the Church’s teaching. Question 3 of the "Dubia" hence would like to clarify whether, even after "Amoris Laetitia", it is still possible to say that persons who habitually live in contradiction to a commandment of God’s law, such as the commandment against adultery, theft, murder, or perjury, live in objective situations of grave habitual sin, even if, for whatever reasons, it is not certain that they are subjectively imputable for their habitual transgressions. After the affirmations of "Amoris Laetitia" (n. 302) on “circumstances which mitigate moral responsibility,” does one still need to regard as valid the teaching of St. John Paul II’s encyclical "Veritatis Splendor" n. 81, based on Sacred Scripture and on the Tradition of the Church, according to which “circumstances or intentions can never transform an act intrinsically evil by virtue of its object into an act ‘subjectively’ good or defensible as a choice”? In paragraph 302, "Amoris Laetitia" stresses that on account of mitigating circumstances “a negative judgment about an objective situation does not imply a judgment about the imputability or culpability of the person involved.” The "Dubia" point to the Church’s teaching as expressed in John Paul II’s "Veritatis Splendor" according to which circumstances or good intentions can never turn an intrinsically evil act into one that is excusable or even good. The question arises whether "Amoris Laetitia", too, is agreed that any act that transgresses against God’s commandments, such as adultery, murder, theft, or perjury, can never, on account of circumstances that mitigate personal responsibility, become excusable or even good. After "Amoris Laetitia" (n. 303) does one still need to regard as valid the teaching of St. John Paul II’s encyclical "Veritatis Splendor" n. 56, based on Sacred Scripture and on the Tradition of the Church, that excludes a creative interpretation of the role of conscience and that emphasizes that conscience can never be authorized to legitimate exceptions to absolute moral norms that prohibit intrinsically evil acts by virtue of their object? "Amoris Laetitia" n. 303 states that “conscience can do more than recognize that a given situation does not correspond objectively to the overall demands of the Gospel. It can also recognize with sincerity and honesty what for now is the most generous response which can be given to God.” The "Dubia" ask for a clarification of these affirmations, given that they are susceptible to divergent interpretations. Rather, one would also need to look at the circumstances or the intentions to know if this act could not, after all be excusable or even obligatory (cf. question 4 of the "Dubia"). For these theories, conscience could indeed rightfully decide that in a given case, God’s will for me consists in an act by which I transgress one of his commandments. “Do not commit adultery” is seen as just a general norm. In the here and now, and given my good intentions, committing adultery is what God really requires of me. Under these terms, cases of virtuous adultery, lawful murder and obligatory perjury are at least conceivable. This would mean to conceive of conscience as a faculty for autonomously deciding about good and evil and to conceive of God’s law as a burden that is arbitrarily imposed and that could at times be opposed to our true happiness.